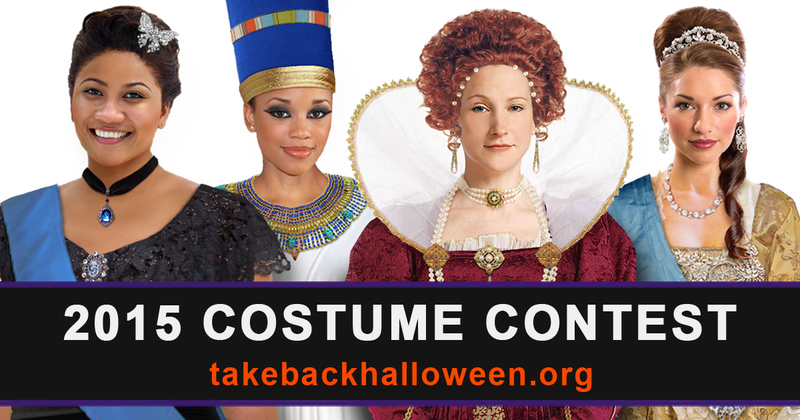 Enter our 2015 Costume Contest! | Take Back Halloween! Enter our 2015 Costume Contest! UPDATE 11/9/2015: Thank you, everyone, for your amazing entries! This year’s contest is our best yet, and we are thrilled by all the terrific costumes. We plan to announce the winners on Monday, November 16. In the meantime, be sure to look through our Facebook album to see the incredible creativity of all our entrants: 2015 Costume Contest Album. It’s time for our 4th annual costume contest, folks! And thanks to a couple of generous supporters, our prizes are bigger than ever this year. So send in your pictures! Make ’em good, because it helps a lot when we’re judging the costumes. We’ll upload all the entries to our 2015 Costume Contest Album on our Facebook page. The deadline for submissions is 11:59 pm EST on Sunday, November 8, 2015. No Glamour Grrl category for juniors, because there will be plenty enough time for that when you’re grown, young lady. This is our wild card category. The same rules apply in terms of the kind of costumes we want to see, but these awards are to recognize special achievements in fabulousness. We never know what people are going to send us, so we’re just leaving the prizes unspecified until we see the entries. Check out those links to our contests from past years to see the kinds of things that float our boat. 9. The deadline for submissions is 11:59 pm EST on Sunday, November 8, 2015.